In depth Risk Management which you need to take advantage of before the actual implementation of a project as this will offer more time for planning and preparation. Becoming an expert in the field of operational risk management is no longer difficult at present with the existence of the operational risk management certification course at Brainmeasures. The operational risk management course offered by Brainmeasures is developed by real experts in the industry in such a way that you will never experience any difficulty understanding all the principles and essential concepts linked to the implementation of the process. It allows you to take advantage of a well-laid out operational risk management training which gives you the opportunity to build an even stronger foundation about operational risk management. By taking part in the operational risk management certification course from Brainmeasures, you will become more familiar about the steps and procedures involved in carrying out the operational risk management process, the many benefits that you will receive from its successful implementation and the different strategies that you can use to make the most out of the process. Completing this certification course is a good way to reward yourself with an operational risk management certificate which proves your expertise and skills in the field. 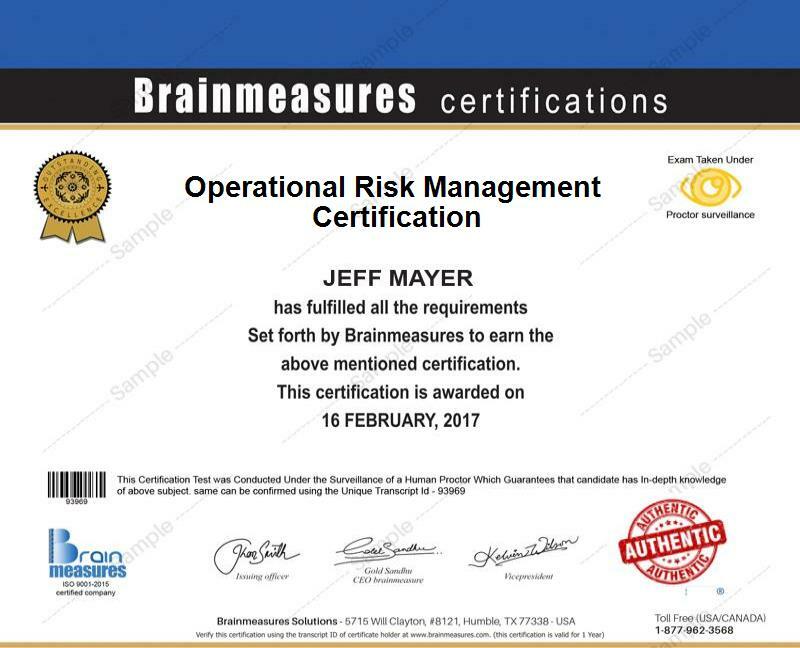 Many professionals are going to receive a lot of benefits from taking part in the operational risk management certification program offered by Brainmeasures. It is extremely beneficial to anyone who wishes to strengthen their knowledge in the field of operational risk management. This operational risk management certification course is even more beneficial for existing and aspiring operational risk managers, chief risk officers, compliance officers, regulators and any other professionals who are responsible in effectively managing operational risks while also effectively supervising the entire operational risk management process at various financial institutions. The jobs that you can get after you successfully complete your operational risk management certification course can be expected to offer you a higher and an even more stable salary. If you decide to use your operational risk management certification to work as an operational risk controller, then you can expect to start earning within the range of $101,000 to $109,000 annually. You can also work as an operational risk manager which gives you the opportunity to receive around $95,000 to $174,000 per year. If you work as an operational risk management director while showing your extensive experience in the field, then expect this career to let you receive around $178,000 to $190,000 annually.